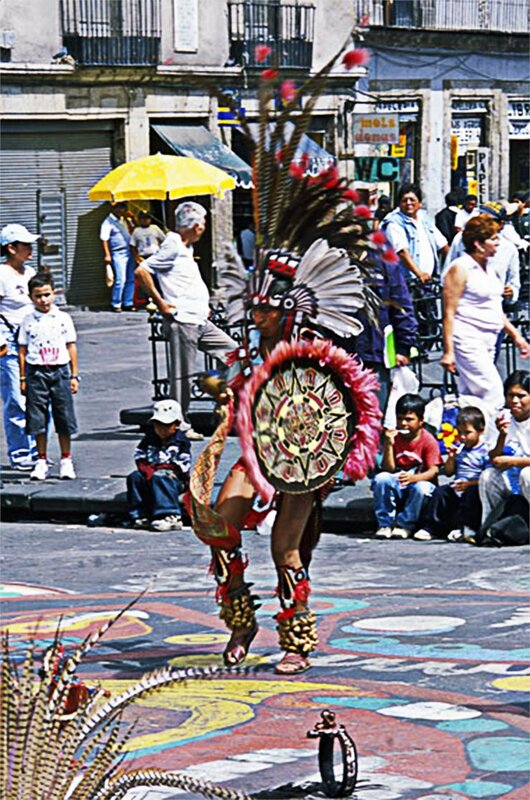 Street performers abound in present-day Mexico City, and among them are dancers and musicians who evoke the pre-Hispanic past. To the beat of a teponaztli or huehuetl, two types of Aztec drums, they perform for the public. This photograph shows them in Mexico City’s zócalo, only yards from where the great Aztec Templo Mayor once stood. Contemporary dancers are often called “concheros,” because of the shell rattles, visible on this dancer’s ankles, used for percussion. The dancer’s shield bears an image of the Aztec calendar stone—a famous pre-Columbian. Feathered shields were carried by warriors and while the imagery on the dancer’s shield is not found on any surviving Aztec shield, it has the benefit of being immediately recognizable to a contemporary audience. On the ground one can see that the group of dancers created an enormous chalk drawing, also based on the Aztec calendar stone, to create an impromptu stage. Even though the Aztec capital was razed and the traditions of Tenochtitlan extinguished in the 16th century, many Mexicans are proud of their Aztec roots. These dancers and musicians have reconstructed Aztec instruments, been inspired by Aztec costume, and have reinvented dance steps. While their performance is informal and directed at tourists, in other places, such re-imaginings of pre-Columbian festivals and dance, many of them begun in the 20th century, attract large local audiences, creating new connections to this history. Schmidt, Peter R. and Thomas C. Patterson, eds. 1995. Making alternative histories: The practice of archaeology and history in non-Western settings. Santa Fe, N.M.: School of American Research Press. Torre, Renée de la. 2012. 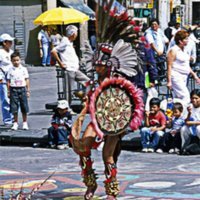 "Las danzas aztecas en la nueva era. Estudio de caso en Guadalajara." Cuicuilco 19 (55): 145-170.